"The book's use of real-world case study vignettes really does go to the heart of the subject matter. This stuff is real, it has real applicability to real problems, and, as with most things in life, it shows how it all comes down to real money in the final analysis. This book shows you what your peers are doing to drive costs out of integration projects and to build new applications without re-inventing the entire wheel-just a few new spokes and off you go. This is a good book. Read it." -Peter Rhys Jenkins, Complex Systems Architect, Candle Corporation"When you get two long-term, acknowledged experts on integration and interoperability together to lay out the current state of the IT universe you expect an immediate return on investment-and this book delivers. It's common knowledge that 90% of total software lifecycle cost is in maintenance and integration, and that needs to drive IT decision-making. With comprehensive coverage of the integration technology landscape, and clear case studies presented at every turn, this book belongs on every IT manager's, every system architect's, and every software developer's bookshelf." -Richard Mark Soley, chairman and CEO, Object Management Group"Today's myriad of integration technologies and alternatives can be daunting. This book presents a framework and process for the evaluation, design, and selection of the appropriate integration technologies to meet your strategic business needs. You will find the templates a particularly useful mechanism to jump-start documentation and drive your decision-making process." -Ron Zahavi, CIO, Global Business Transformation, Unisys Global Transformation Team; author of Enterprise Application Integration with CORBA"It is refreshing to read a book that presents a good business approach to the integration challenge facing most business leaders today, while at the same time educating them about the major components of the required technologies and management practices changes required. The narrative, examples, and templates establish a common reference point between the business and the technology organizations. A must-read for senior business leaders challenged with the complexities of business integration, as well as Senior IT Leaders challenged with shrinking budgets and lower tolerances for failures." -Chuck Papageorgiou, managing partner, Ideasphere"Integration has, and will continue to be, one of the success indicators of any enterprise project. Failing to understand the nuances of integration is a critical mistake managers cannot afford to make." -Marcia Robinson, author of Services Blueprint: Roadmap for Execution"A much-needed book; it ties together the business and technology aspects of information system implementation, emphasizing best practices for really getting things done. I believe that both the technical and business communities will benefit from the in-depth material provided in this book." -Dr. Barry Horowitz, professor of systems and information engineering, University of Virginia (former CEO, Mitre Corporation)Integration of applications, information, and business process has become today's #1 IT investment priority. Most enterprise integration books simply explain the technology. This one shows exactly how to apply it. It's a step-by-step roadmap for your entire project-from the earliest exploratory stages through analysis, design, architecture, and implementation. 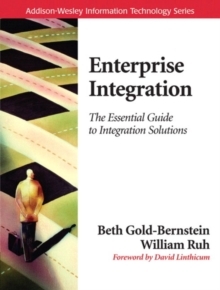 Renowned enterprise integration experts Beth Gold-Bernstein and William Ruh present best practices and case studies that bring their methodology to life. They address every stage from the decision-maker's and implementer's point of view-showing how to align business requirements to specific solutions, systematically reduce risk, and maximize ROI throughout the entire lifecycle. Coverage includes:Supporting strategies, tactics, and business planning: enterprise integration from the business perspective Defining realistic project success indicators and metrics Establishing integration architectures: supporting near-term needs while building reusable infrastructure services for the long-term Adopting metadata architecture and standards Implementing four essential implementation patterns: application, information, composite, and process integration Understanding service integration and implementing service-oriented architectures Providing organizational structure and governance to support effective integration The authors provide detailed plans and specification templates for application integration projects-both in the book and on the CD-ROM. These projects include identifying business drivers and requirements; establishing strategy; and integrating services, information, process, and applications. Enterprise Integration was written for every member of the integration team: business and IT leaders, strategists, architects, project managers, and technical staff. Regardless of your role, you'll discover where you fit, what to do, and how to drive maximum business value from your next integration project.